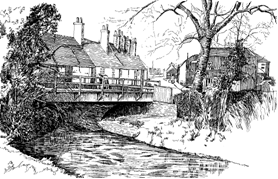 Wallington Village Community Association is the civic amenity society that serves Wallington, an old settlement within the borough of Fareham in Hampshire. Geographically the village lies at the head of Portsmouth Harbour and is bounded to the north by the M27 motorway, to the east by the motorway approach road and lies for the other two sides beside the River Wallington. Wallington Village Community, the forerunner to WVCA, was born out of adversity in 1979 to fight a Southern Water authority proposal to demolish the rare 5 arch bridge opposite the Cob and Pen public house and to encase the river Wallington in a concrete culvert from the M27 to the Delme roundabout. Raising funds to fight the case led to 18 months of fund raising events in the village and our village magazine the 'Once in a While' was launched at this time. The fact that the bridge is still standing and the river still flows for everybody (including the ducks, fish, kingfishers & herons) to see and enjoy is testament to the efforts of those few community minded folk. The bridge was adopted as the central feature of the WVC logo to recognise its status as the ‘founder’ of the association. But there is a greater symbolism attached to bridges because they join things and they join people. To continue and develop the newly awakened community spirit we needed a permanent venue for meetings and community events. Fareham Borough Council donated a redundant wooden building and a site for it. The building was well over 50 years old and had served many organisations throughout the Borough. In 1984 our first village hall opened and many organisations were anxious to use it. Wallington Wine Circle, Garden Club, Preschool and Yoga all began at this time and other organisations such as Fareham Wheelers cycle club moved to Wallington from other venues. The maintenance costs and structural deterioration soon brought the realisation that a replacement would be needed. A survey at the time gave the hall a life of 10 years before major structural repairs would be required. So in the mid 1980s a plan was drawn up to replace the hall with something the village could be proud of for many years to come. A major campaign began to raise the estimated £250,000 needed, and alongside events that had already become regular highlights (the Annual Fete, ‘Music on the Meadows’, monthly lunches, dinners and dances, Christmas Fairs and jumble sales) new activities were introduced - recycling for Wallington, Buy a Brick, ‘Walling tins’ saving loose change and the 200 Club. Those that could not help physically were generous with donations. With careful investment of the money raised in the Village there was about £100,000 in the building fund by July 1995. Grants from Hampshire CC, Fareham BC, Foundation for Sport and Art, and Rural Development Commission made up the balance necessary and we were ready to start building. The new hall opened in October 1995 while the old hall was sold to Fareham and Gosport Scout Group who carefully dismantled and re-erected it in Bridgemary to serve as their HQ. Please see the link to The Village Hall. The constitution of the Wallington Village Community did not allow it to own and operate a Village Hall. A new body, with a new constitution and a new name was needed. It was called the Wallington Village Community Association.